A friend’s birthday presents the perfect opportunity to let him/her know you appreciate his/her life and companionship. So if it’s your friend’s big day today, use the following birthday quotes to let them know they are on your mind. A good friend is the best gift life can give, but since you already have that in me, I decided not to bother buying you any gift this year. Being friends with you is so much fun that they should make a sitcom about us! Happy birthday, bestie. I’d be honored to celebrate your birthday with you, dear friend. In other words you can hangover at my place! That cake was so expensive that I just want you to take a few licks, and then I’m taking it back for a refund. Happy birthday! Happy birthday, dear companion and friend. I hope that life affords you the best psychiatrists money can buy. You are now old enough that you’ve started losing your hair, but I want you to know that you will never lose me. Happy birthday, cherished pal! There is more disk space on my iPhone dedicated to you than anyone else. Happy birthday, best bud. You are the best gift a friend can have. Happy Birthday! A true friend is someone you can take a loan from without paying back, and I’m blessed to have a true friend like you. Happy birthday. No matter where technology takes us, you are the type of friend that I would never replace with a robot. Happy birthday. Happy birthday! May your life bring you everything my heart desires, because I already know you and I think just alike! I decided not to get you booze this year and instead resorted to a more wholesome gift as by this time, half of your blood is probably alcohol anyway. Happy birthday! And drive safely. I wish you a birthday so memorable that you’ll be too drunk to remember it. Happy birthday! Wishing you the most glorious future you or I could imagine – surviving a nuclear holocaust, being hunted by robots and saving mankind from destruction. Happy birthday! No matter what prison you may find yourself in the future, know that my love is right there with you. Happy birthday. May you get so intoxicated on your birthday that you don’t wake up again until your next. A lot of people consider you as a dumba**, but I like to think of you more as mentally challenged, and like every challenge you have faced in life, I know you will overcome this one. Happy birthday! Not all the words in the English dictionary are enough to explain how much I love you. You will forever remain my best friend. Happy birthday!!! My dearest friend, my original intention for this birthday of yours was to give you the sweetest and fascinating thing on this earth, but then I realized that it would have to be you. As my best friend, it’s my solemn duty to always remind you that: “old is the new bold”. Therefore boldly embrace this birthday of yours. I doubt anyone knows me better than the way you do. Heck, I think you even know me better than myself. And boy, I’m quite a complicated person to figure that out. This goes out to my friend, the single most important person in my life at the moment. Let’s set the club ablaze with your awesomeness tonight. Drinks are on me as well. Funny, check. Beautiful, check. Loyal, check. What more could I ask from a friend? You are to me like the way a lighthouse is to a ship. Thanks for being by my direction. Happy birthday, sweetheart!!! Today, I celebrate the birth of girl who is more than a friend to me. As a matter of fact, she is the sister I never had. Big ups for being this sweet and smart angel!!! What is the point of learning from yesterday when you have an absolute smart friend to guide you today? Happy birthday, guru!!! All the cements in world would fail miserably at holding me together. If I ever needed a strong adhesive, I know exactly who to come to. That person is you. In retrospect, there have been times when my problems were not so grave, nonetheless, you comforted and understood me. Thanks buddy!!! If the world knew how much of a nourishing force you are to the mind, it would bottle you up and sell to the affluent in the society. Rest assured that I’m not telling anyone about this secret of yours. Maybe it is because I am too selfish. With the exclusion of you, no one else knows the full lyrics to the song playing in my heart. And you sing the song so beautifully well. In past years that I have known you my memory has been so good. Magic? No! One is expected to have a tight memory by doing unforgettable and amazing things with you. Wanna know how I know I have the best friend in you? My wifi connects instantly when I walk into your house. See, we even kept up with the changing tech trend. I may not always be around to encourage you, so please accept this gift, and whenever you look at it hear my voice and feel my spirit pressing you to never give up. Happy birthday. You’re the type of friend that when I’m feeling lazy I think of your work ethic, and then feel embarrassed. Stay strong for us all, and happy birthday. Terrific times, fantastic friends. Here’s to another memorable Birthday! Happy birthday to the funniest friend life has blessed me with. I hope that you have a long life and are able to bring the same joy and laughter to everyone you meet! I never knew you and I would become friends like this. May God continue to bless both of our lives with surprise blessings. Happy birthday. Warm birthday wishes, dear friend. I implore you to stay focused, work hard and make a lot of money for both of us to enjoy! I enjoy spending holidays, birthdays, and every day with you! Happy birthday, buddy. Hoping you never stop being the wonderful person that you are. Happy birthday! I know that a glorious future awaits you, and my greatest wish this year is that you will also come to realize the same. I admire you for never taking shortcuts but always looking challenges in the eye and comforting them. Thank you for being my inspiration! Happy birthday. I hope that life will not only grant you countless days but innumerable opportunities and moments of great joy. Happy birthday, and thank you for giving us someone to look up to! As you celebrate your birthday, I hope you’re able to shake off the disappointments of the past and instead focus on becoming a better person with each passing day. Happy birthday, buddy. Life is very, very short, so spend every moment of it being happy. A happy birthday to my absolute best friend in the entire world. You deserve to be pampered today considering the fact that you have been my chief source of fun, affection and wonder. You are like the sweet and lovely looking nectar that attracts the most bees. In your case, this nectar is the unselfish heart you possess. Thank you for thinking of me more than I do for myself. You are the kind of friend who was made even before I needed you. I call friends like you proactive friends. You are like my spring water. Not only do quench my thirst but you give the spring I need to bounce over all my problems in life. I have had countless friends, right from crèche until now, but only you have been able to leave permanent footprints of love and compassion in my heart. One of life’s greatest marvels is the fact that two, with no blood ties whatsoever, can grow separately without necessarily growing distant. In our case, we continue to grow from strength to strength. The road to success is always filled with friends like you who are eager to lend a helping hand. 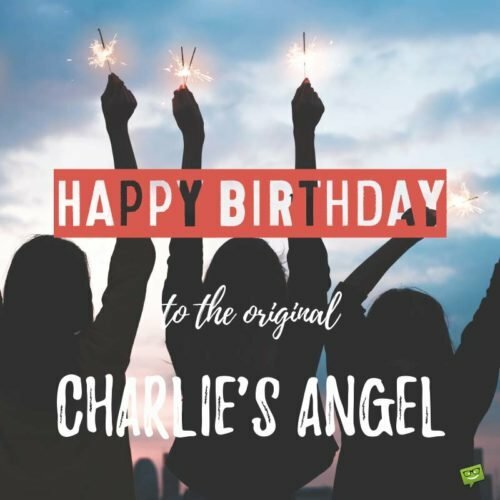 Happy Birthday to the original Charlie’s Angel. May your life never be separated from true joy. Happy birthday, my sweet sunshine. Please accept this birthday gift as a constant reminder that I love being your friend, even at times I may not act so. May good health, prosperity and all of the benefits that go along with them be yours forever. Thank you for being an inseparable friend during my darkest hours. My true wish is that our relationship lasts a lifetime. Happy birthday. Happy birthday, friend. I hope the future brings us closer together than we even already are! May life forever give you the joy of heaven. Wishing you absolutely nothing but true happiness. Happy birthday! Happy birthday to the coolest person I know. I hope we get to chill a lot more together in the future than we have in the past. I’m sorry for anytime I may have hurt you and am elated that our friendship survived. Happy birthday to the most forgiving person I know! I love you so much that buying this birthday gift doesn’t feel like an obligation but more like a pleasure. I can’t imagine life without a truly amazing buddy like you. It’s like you’re in sole possession of the left side of my brain. Happy birthday. I don’t like you very much, but I love you enough to make sure I extend to you a very happy birthday on this special occasion. Happy birthday, dear. If everyone had a friend like you, there would be no more misery in the world. May God give you nothing less than a heart that constantly spills over with bliss. Wishing you a great birthday celebration filled with beautiful surprises and sunshine. I see all of life’s beauty just from a single glance at you. The memories you and I continue to make is my only solace in hard times. Every day, you shine more light into my life than a trillions stars will do in a million years. May the rest of your days be very prosperous and rewarding. You, my friend, are the best blessing life could ever throw my way. You give me so much happiness. I hit the biggest jackpot when I met you. The connection and chemistry between the two of us is one that could last for millennia. For now, we have a birthday to celebrate to the max. If everything in life abandoned me, and I was left stranded all alone, I know I will be able to count on my ray of sunshine. That’s what you mean to me. I haven’t been the best of friend lately, but that hasn’t reduced the love and attention you give me. It’s the rarest of rarity. Thank you very much for all your consideration. If I were to describe our friendship using one element from the periodic table, I would pick gold, a rust proof item that can withstand the severest of conditions. It also shows that on my priority list A there is U. And AU doesn’t rust. I remember how uptight and quick fused I was in the past. But then ever since you came in with this beautiful smile of yours, my life has been nothing short of clarity and inner peace. True friendship can be compared energy, a never ending story without a beginning and an end. It explains why it feels like I have always known you all my life. Good friendship is the perfect elixir to a long and exciting life. It has your back even when your back begins to abandon you. So here is to the biggest support in my life.